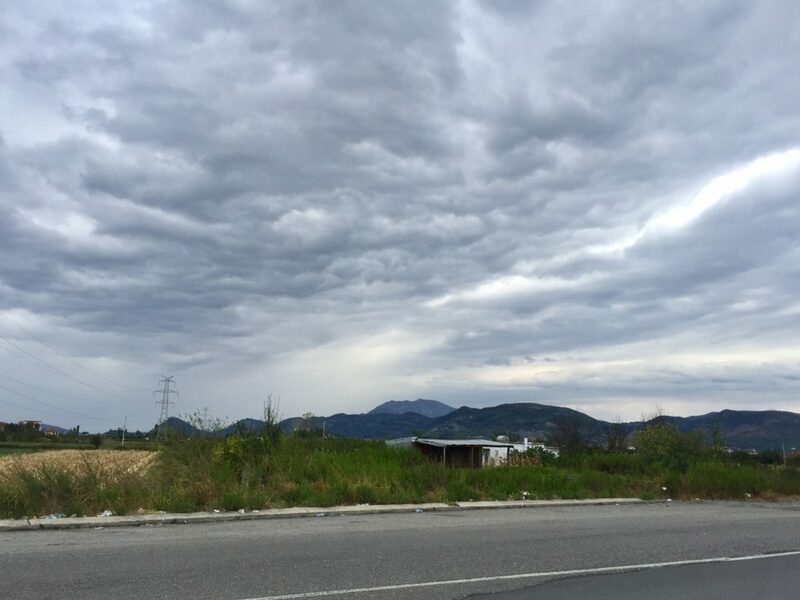 As I stood on the side of a highway in Middle of Nowhere, Albania, waiting for the perfect moment to run across it, I thought to myself: so maybe I had gotten a bit cocky. 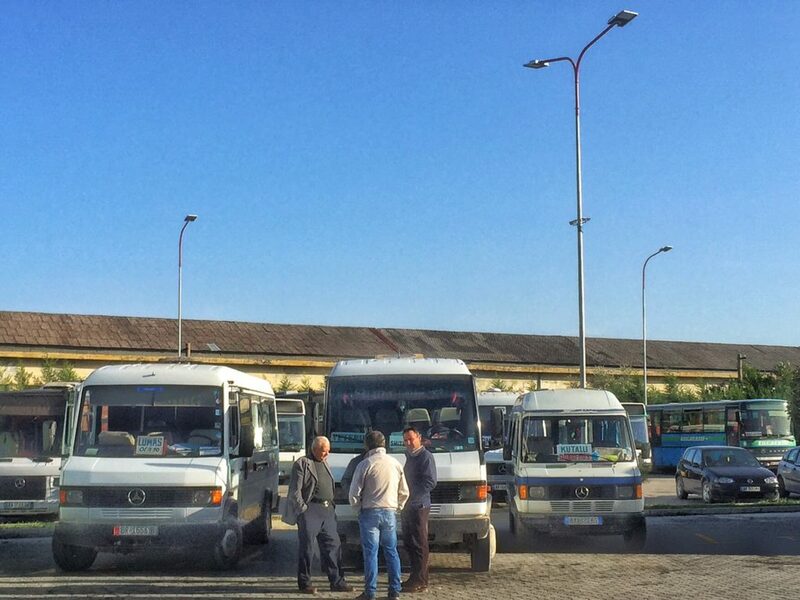 Everyone told me that public transit in Albania was a mess. I had just been bragging about how I didn’t find it that hard to get around in Albania. Sure, there’s no Googleable information, but all you have to do is ask any Albanian. Even if they don’t know, they won’t rest until they find someone that does. 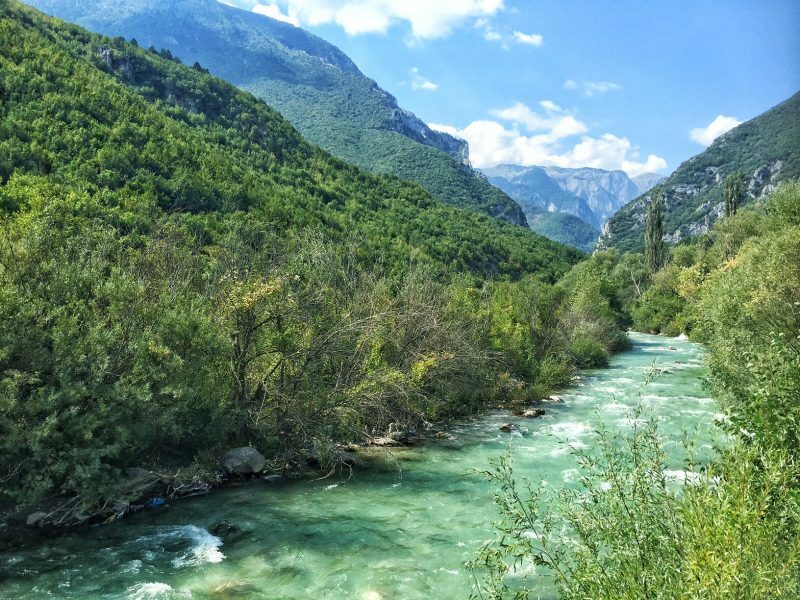 I was in Shkodra, Albania, and my initial plan was to go to Lake Komani, take the ferry, and do the epic daylong hike from Valbona to Theth. I couldn’t have been more excited. But then the rain hit — and hit, and hit, and hit. Conservative weather reports estimated four days of rain; more apocalyptic ones, eight. So clearly a 7-hour hike through the (yes, this is its actual name) Accursed Mountains (also known less menacingly as the Albanian Alps) was probably unwise. So, as one does in the Balkans, I improvised. 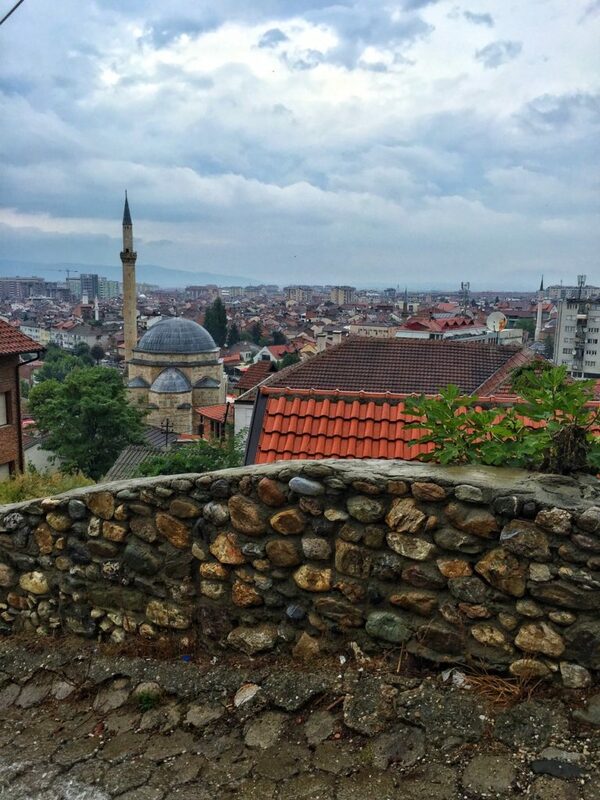 Together with an Australian couple, we asked the people who ran Wanderers Hostel for advice on where to go next, and we decided on heading to Prizren, Kosovo. The weather would still be crummy there, but less so, and with beautiful surroundings plus lots of cafés and museums. Getting there, in theory, was simple enough: take the bus to Tirana, ask to be let off at Milot, then wait about an hour to catch the bus heading to Prizren. No problem. Except that despite having told the bus driver multiple times we needed to get off in Milot, we found ourselves hurdling past the red pin I had dropped. By the time we finally managed to communicate that we needed to get off, we were about four kilometers away from where we needed to get the bus. So, run across the highway we did, which sounds more dramatic than it was in theory, as we were able to stop in the middle and time things properly. We tried to flag down some cars, failed, then succeeded in flagging down a bus, who happily dropped us back in Milot town proper without charging us a single lek. So we waited at the “bus station” in Milot, and I use those air quotes with purpose, because in reality, we were just standing next to a dumpster in the middle of an open air market. We asked a woman if we’re in the right place, and after learning that yes we were, she proceeded to try to hand us generous fistfuls of the cake she was holding. But since the dumpster/squat toilet smell was churning all of our appetites, we declined politely, and she walked off looking only slightly wounded. After waiting for a bit over an hour, we grew bored and restless. We decided, well, why not at least try to hitch? Hitchhiking in Albania is common and safer than it is basically anywhere in the world. The clouds which had been flexing their muscles ominously looked more inclined to pour down upon us by the minute, so we decided to make a sign. Finding a piece of cardboard laying next to the dumpster because, well, Albania, we took a Sharpie that my new Aussie friend had been smart enough to bring with him, wrote Prizren on it, and went for it. I never thought of a Sharpie as a backpacking essential, but I do now. Not even ten minutes later, a car stopped for us: a gorgeous 1998 Audi with two young college-age guys in it. I spoke no more than five words of Albanian; these guys spoke a little English. After some halting communication, we were able to ascertain that they’re going to Kukës, a town on the Albania-Kosovo border. We decided that that was better than nothing — at least we’d be closer to Kosovo, where it’d be easier to hitch or bus the rest of the way there. The rumors about Albanians are true: they drive like maniacs. 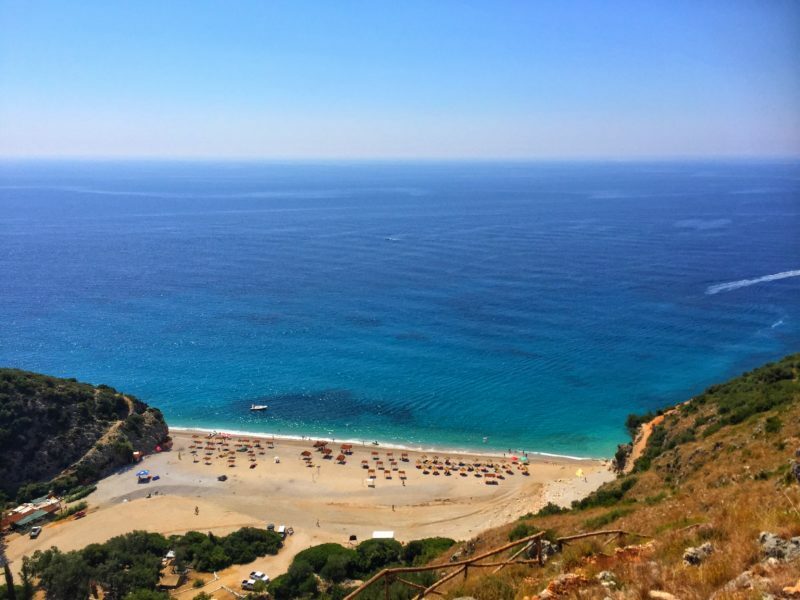 The driver, a muscular twenty-something guy studying law, remarked proudly that it only takes him one hour to drive the 150 kilometers from Kukës to Tirana. He regularly drifted into the other lane to overtake slower cars, skillfully but terrifyingly maneuvering the car. After many white-knuckled miles, he asked if it’s okay to stop for a cigarette break. Happy for a break, we said of course, and they pulled over. Here comes into play the other rumor about Albanians: they are insanely hospitable. Things got momentarily heated when they insisted on buying us all sodas, despite our protestations that we wanted to buy them drinks. They shared a delicious cornbread-style cake topped in cheese, cucumber, and tomatoes they had bought in Milot. We each took a piece, and then they passed it around yet again, insisting we take more. I won their favor by happily taking another piece. We continued on, passing through beautiful mountains draped in fog. Mercifully, he slowed the car down to a responsible speed as we made our curving path through what felt like clouds. We arrived in Kukës and quickly passed it. A sick feeling hit my stomach for a moment as I glanced at the blue dot quickly leaving the town I thought we were getting dropped off in. We began to murmur. Noticing our quiet nerviness, the driver turned around to say “we take you all the way.” And we’re all floored. These guys not only picked us up, bought us sodas, and fed us — now they’re willing to cross an international boundary and travel 40 minutes out of their way, just to make sure we get to our destination? We emitted a flurry of thank yous and faleminderits, and the guys drove on, chatting to one another in Albanian as we marveled in the backseat at our luck. They dropped us off right in the center, and we tried to insist on buying them coffee or a beer before they drove back to Albania. They rebuffed every offer we made, accepting only a firm handshake in return, and drove off into the rainy mist. Thanks Gabriela! 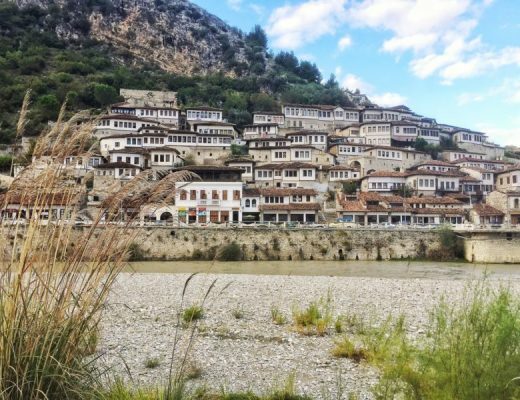 Be sure to hitchhike around when you get to Albania, it’s such a fun way to experience the country and the people! 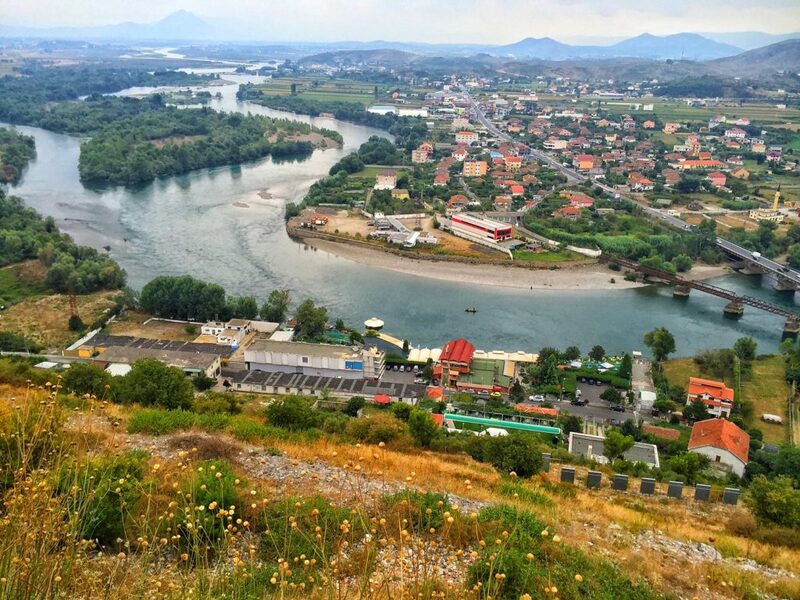 I did the same trip, except I bought a bus ticket at some travel agency in Shkodër called Crazy Holiday. They took me by car to Milot and then I took the bu to Prizren. hhaha if Albania’s tourism board had to redo their slogan, I’d say Crazy Holiday would be pretty accurate 😉 Albanian drivers are freaking terrifying! 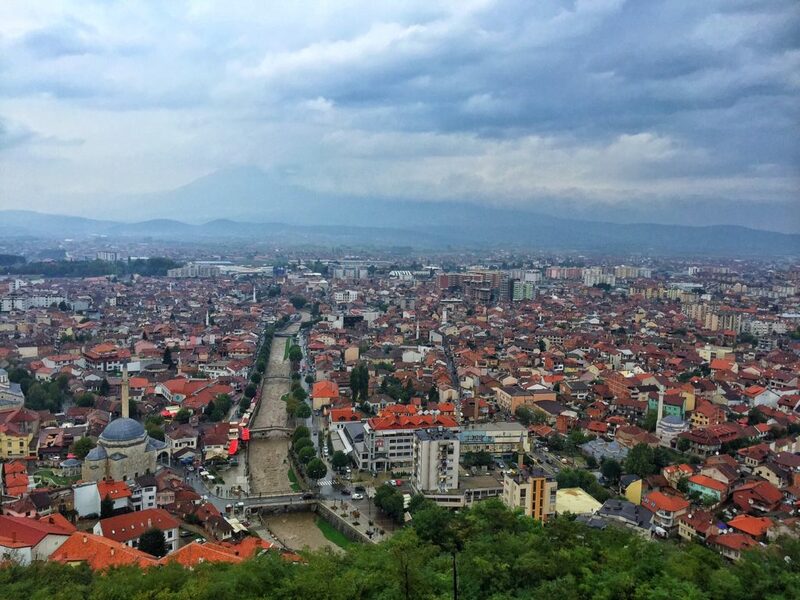 Glad you made it safely, and hope you enjoyed Prizren as much as I did!! Hello there! The story is so funny and amazing! 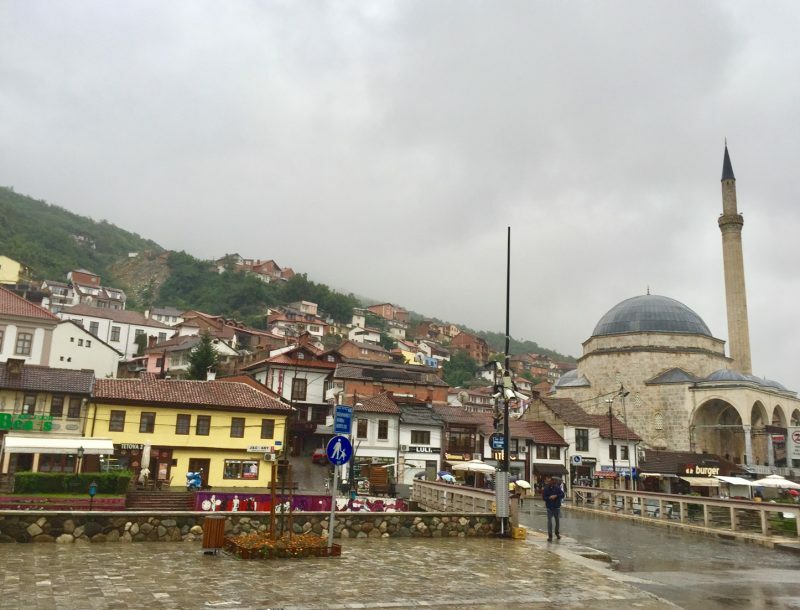 Me and my GF are in the same situation now, we are in Skhoder, it’s crazily raining and we want to go to Prizren in two days! We will try to do the same thing, bus to Tirana stoping in Milot and the another bus to Prizren. Can someone tell me the exact position of the “bus station” in Milot? Hi Kevin! That’s so funny you’re in the same situation. Sorry this comment is probably coming too late (I was traveling a lot the last few days and fell behind on replying to my comments). Unfortunately, there is no real “bus station” in Milot — there is one main road, the road with all the fruit and vegetable stands, and that’s where the bus rolls through — if it rolls through, that is! Hope you got in ok! Please update us! I loved this so much, you’ve really captured how crazy it is travelling through Albania and also the incredible hospitality of Albanian people. I’ve also just spent an hour reading your blog god damnit, this wasn’t my plan for the night hahaha. Hi Dani! Thank you so much, I’ve gotten sucked into the blog vortex many a time and I can relate – glad you found it fun reading! <3 Hope you are having (or if you're home already, had) a great time on your Balkan trip!